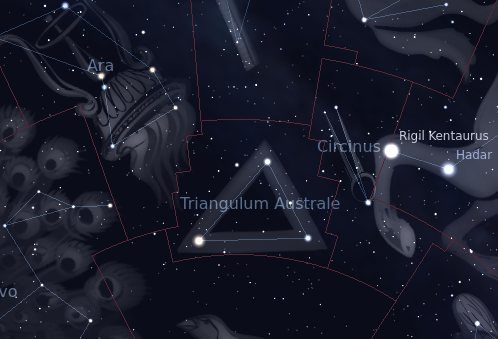 The constellation Triangulum Australe. Roll mouse over to see labels. 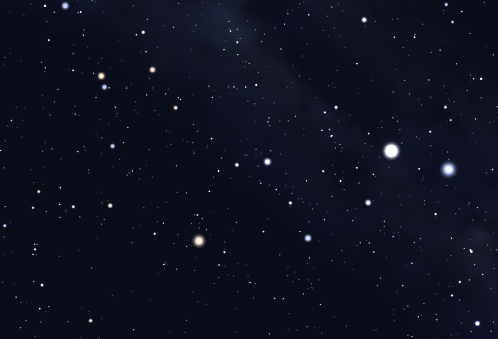 Triangulum Australe is a small constellation which lies close to the south celestial pole. Across much of the southern hemisphere it is circumpolar, but it appears highest in the evening sky in the months around April. It is the southern counterpart of Triangulum, and is of a similar size. It was introduced by Keyser &amp; de Houtman in 1598. Comprising of one second-magnitude and two third-magnitude stars, it is a full magnitude brighter than the northern triangle. The southern triangle is home to only one bright deep sky object, the open cluster NGC 6025, also known as Caldwell 95. Triangulum Australe contains the following Caldwell object: C95. The following constellations neighbor Triangulum Australe: Apus, Ara, Circinus, Norma.